Dr. Ball graduated from Washington State University in 1984 earning his MS in Veterinary Toxicology and Doctor of Veterinary Medicine degrees. Following graduation Dr. Ball returned to his native state of New Hampshire where he practiced in Amherst for 5 years. Several opportunities allowed him to practice in Kona, Hawaii and Phoenix, Arizona before establishing Manchester Animal Hospital in 1992. Dr. Ball is a member of several local and national associations. These include, New Hampshire Veterinary Medical Association (NHVMA), American Veterinary Medical Association (AVMA) and American Association of Feline Practitioners (AAFP). 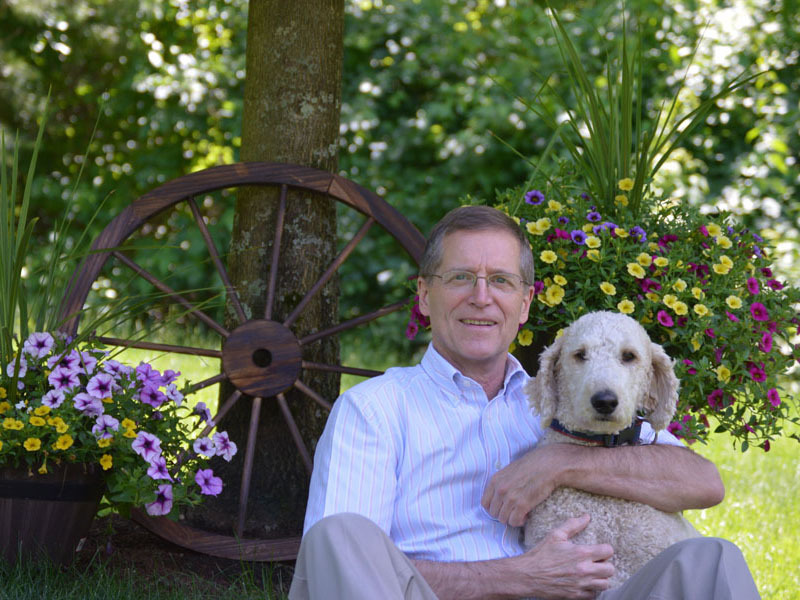 Dr. Ball’s leisure time is spent enjoying the lakes and mountains of New Hampshire with his dog Winni. Dr. Lemay was born and raised in Manchester, NH. She received her bachelor’s degree from Middlebury College in Vermont and attended Veterinary School at Cornell University in New York. Upon graduation from Cornell in May, 2008, she spent several months practicing both large and small animal medicine before deciding to pursue a career as a small animal practitioner. Dr. Lemay has been a veterinarian at Manchester Animal Hospital since 2010. She has a special interest in surgery and dentistry, and she enjoys wellness and preventative medicine, as well as managing acute and chronic diseases. 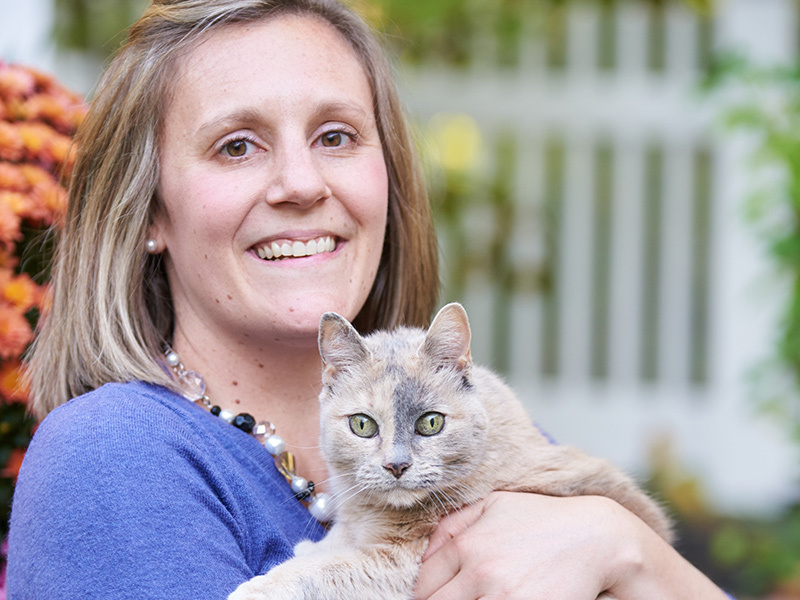 Outside of work, Dr. Lemay enjoys spending time with her husband, two daughters, and their family cat, Elle. She also continues to play soccer, a sport she has enjoyed since her youth. Dr. Brown was born and raised in Southern Vermont, and completed her undergraduate and graduate educations in Massachusetts. Upon graduating from the Tufts University School of Veterinary Medicine in May of 2000, she went on to complete a one-year internship in small animal medicine and surgery at the Veterinary Referral & Emergency Center in Norwalk, Connecticut. Dr. Brown remained at this group practice for six more years working as an emergency clinician and then as a general practitioner. While working in general practice she cultivated strong interests in internal medicine and ultrasonography. She has been practicing in Southern New Hampshire for the past 3 years. Dr. Brown has been very happy with her move north and loves Southeastern New Hampshire. Not only is she closer to family, but she is also closer to favorite locales such as the Maine seacoast and Boston. She keeps active with many interests outside of work, especially with her dog Porter. 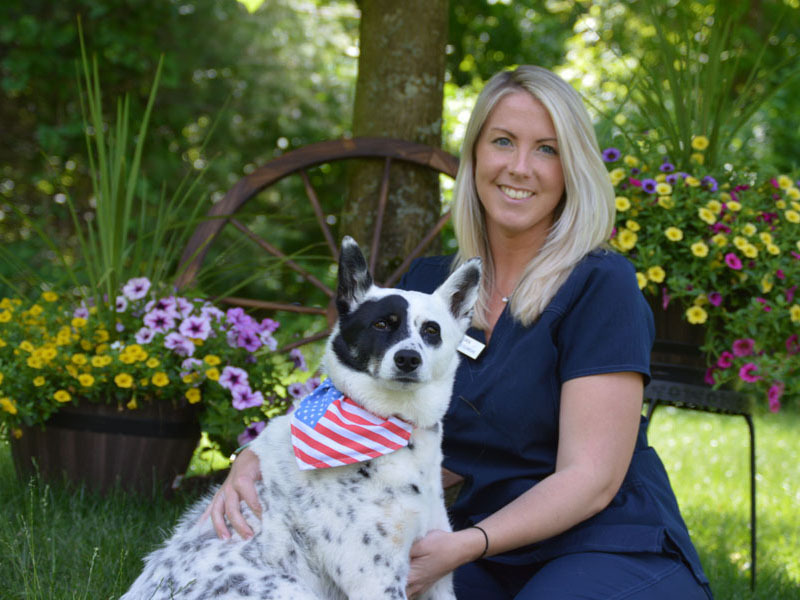 Nicole started her career in the Veterinary industry in 2001 as a kennel attendant, working her way through the kennel and client service positions while obtaining her Bachelors in Business Management. After graduating college she worked as a Hospital Manager at a Veterinary Hospital in Southern NH for 7 years. Later moving on to another hospital and finally settling into Manchester Animal Hospital in 2018. Nicole has a passion for providing the best medicine to our patients and the clients who love them. Striving each day to ensure great customer service, excellent patient care, and providing an enriching, supportive and family oriented work environment. In her free time, Nicole enjoys spending time with her family, friends and her 2 dogs, Frankie and Jenny. Growing up Beth always knew she would have a career with animals. At 14 years old she started grooming dogs and worked as a professional groomer for many years to follow. Eventually wanting to transfer her skills over to the medical side, becoming a veterinary technician was the perfect fit. 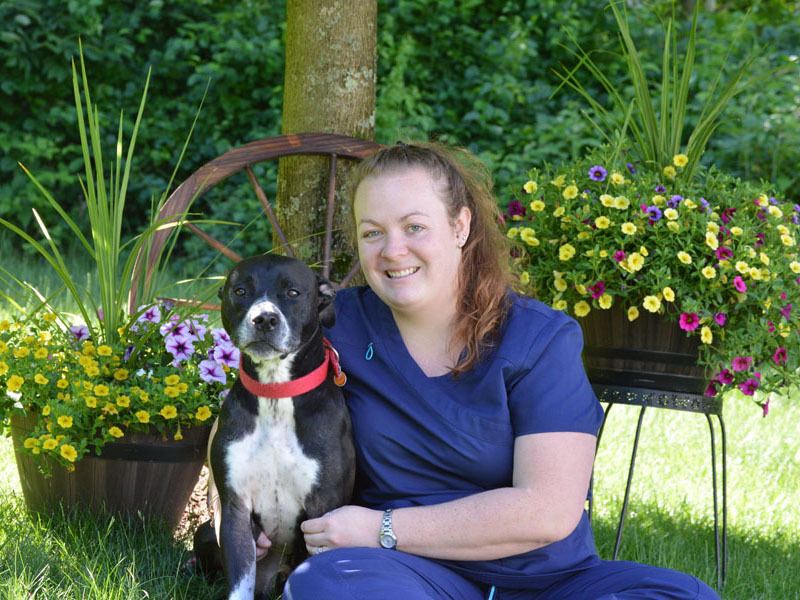 She graduated in 2013 from Great Bay Community college with a Associates degree in Veterinary Technology, and that same year passed the VTNE to became a Certified Veterinary Technician. Since becoming a CVT she has enjoyed working in general practice with a special interest in dentistry and caring for senior pets. Beth has a paralyzed paraplegic cat named Woodrow, a cockapoo named Fern and a turtle named Breezy. In her spare time she enjoys the beach, kayaking, and strolling the streets of Portsmouth with her fiancé shopping and trying new restaurants. Originally from Rhode Island, Sarah moved to New Hampshire in 2013. She knew from a young age she was passionate about animals and their care. All through high school she volunteered at her local animal shelter where she began to learn about veterinary medicine. After graduating high school she started her college career at Green Mountain College in Vermont majoring in Environmental Studies, but left after one year to pursue her passion of working with animals. 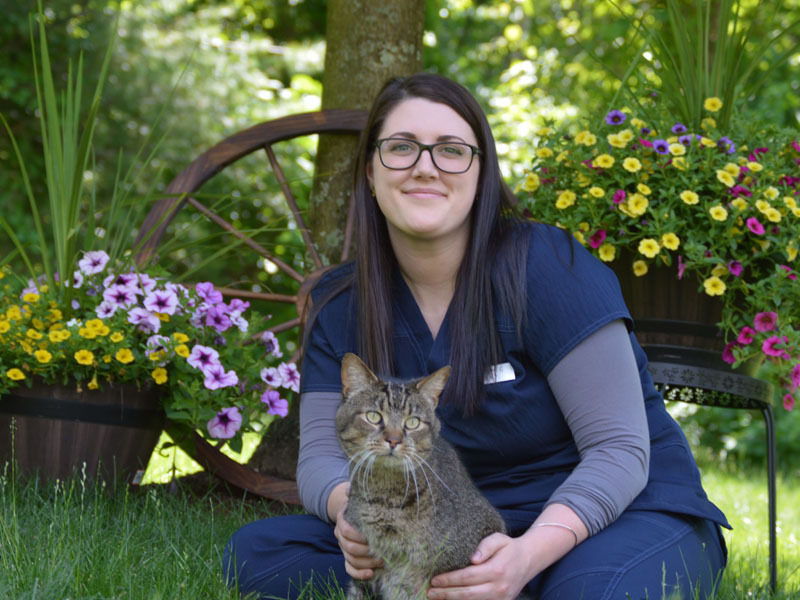 Sarah then attended Northwestern Connecticut Community College and graduated with an A.S. degree in Veterinary Technology, and that same year passed the VTNE to become a certified veterinary technician. 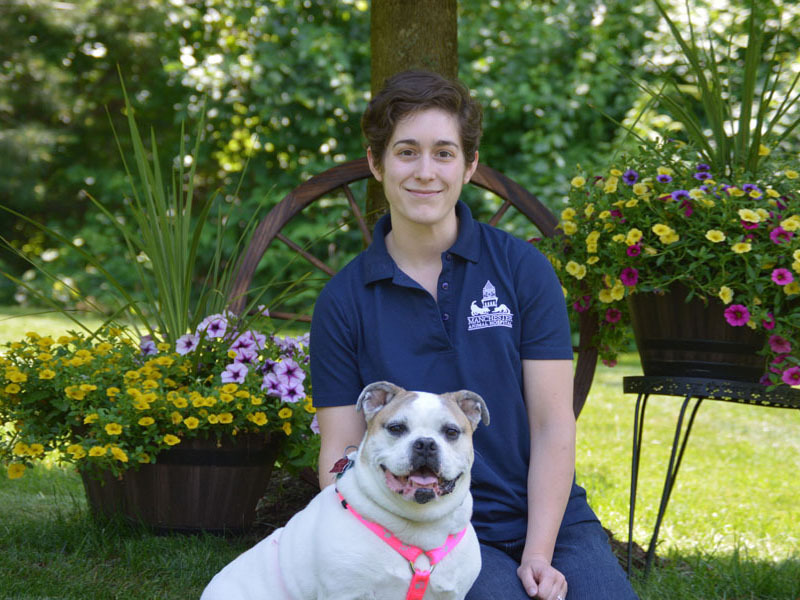 When she isn’t caring for animals Sarah enjoys spending time with her husband (who is also a veterinary technician) and her English Bulldog mix, Ollie. Her hobbies include hiking, indoor cycling and binge watching Netflix. 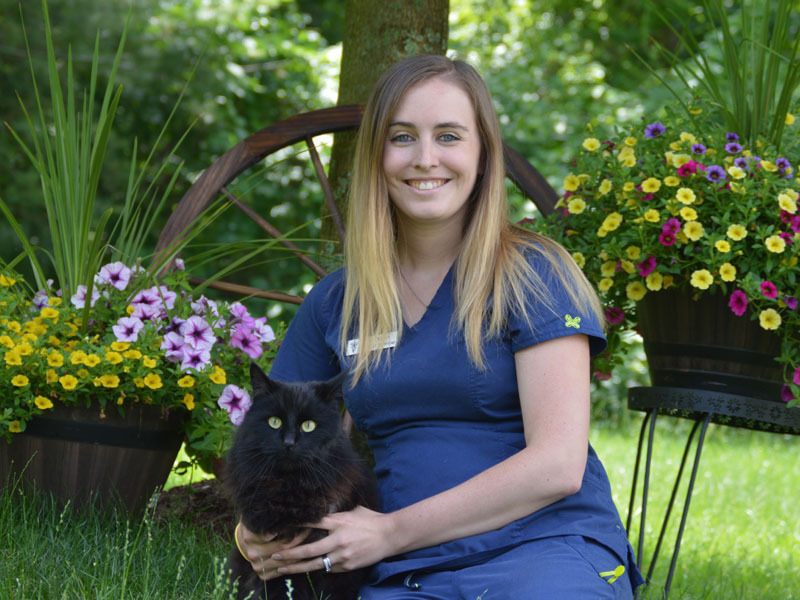 Brittany has been part of the Manchester Animal Hospital team since December of 2008 after graduating with a Small Animal Care Degree from the Thompson School of Applied Science May 2008. Through the years she has learned a tremendous amount when it comes to client education, in-patient care and monitoring of anesthesia. 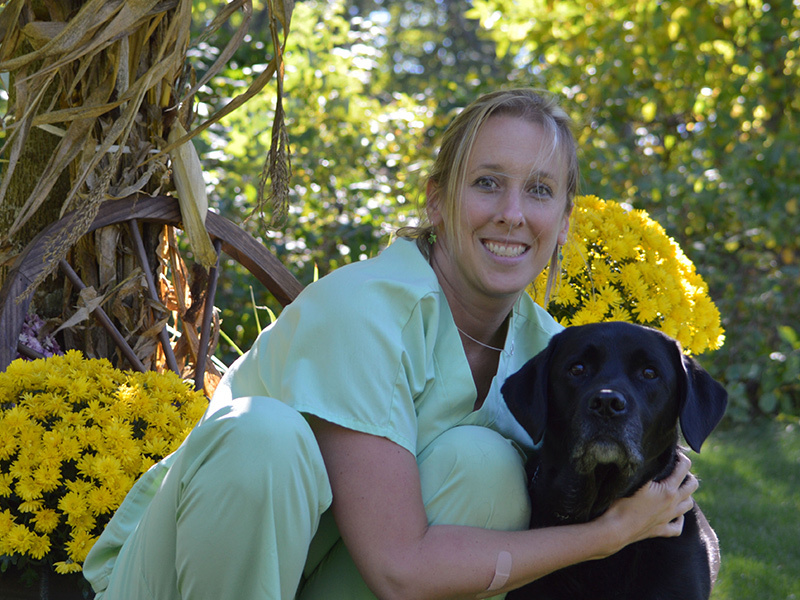 She enjoys all aspects of Veterinary Medicine but has a particular interest in client education and in-patient care. She enjoys coming up with ways to help better clients understanding of the importance of the services we recommend. In her free time she enjoys playing softball with her co-ed softball team on Sundays, paddle boarding with friends and visiting local wineries. She has one cat named Righty who she loves spending time with. Righty was a former hospital cat who lived in the back office and treatment area with Lefty who still currently resides here in the hospital. 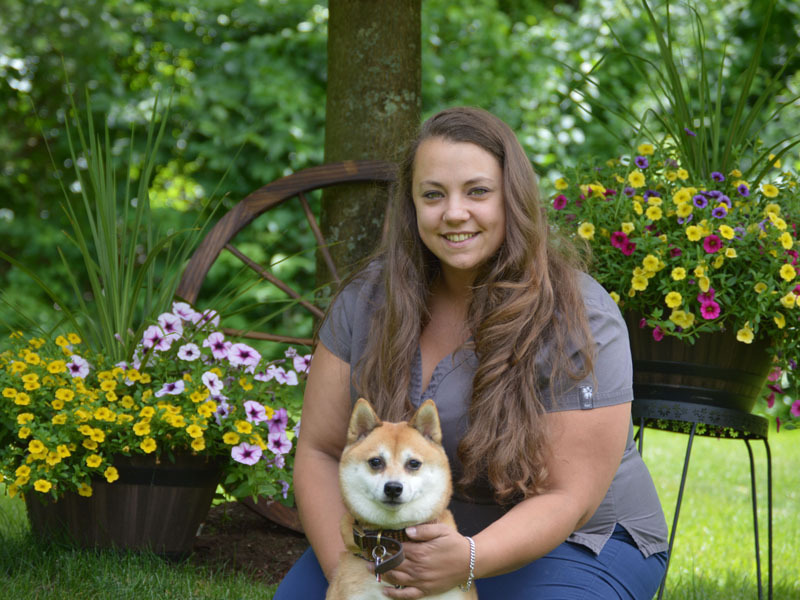 Sara is currently working at Manchester Animal Hospital as a Veterinary Technician, while she awaits a transfer acceptance to Virginia-Maryland Reginal College of Veterinary Medicine to become a DVM. Sara first began working with our team in 2013 when she returned from Arizona where she had obtained a Bachelor’s degree in Biology with a minor in Chemistry from Northern Arizona University. While living out west she worked as a private ranch hand, caring for and working with 4 incredible Percheron/ Percheron Crosses and 4 more wonderful saddle horses. Along with this she was hired on as an intern at Continental Animal Wellness Center to begin training not only a technician but a hopeful doctor. It was clear at this point that her dream was to work with both large and small animals. Once Sara returned to New Hampshire she began the intense process of applying for Veterinary School. One year later she was accepted into St. George’s University College of Veterinary Medicine in Grenada, West Indies. Here she completed 2 semesters but in short realized island life was not her cup of tea and knew her education should be completed state-side. Sara has always been enthusiastic about this field and more importantly has a genuine love for animals. Her favorite of course, Bailey (her own) a 6 year old Blue Heeler cross that she rescued as a puppy in Arizona. In her spare time she is always looking to stay active, whether it be hiking with the dog, playing soccer, working out or boating up on Lake Winnipesaukee with family and friends. She enjoys any opportunity to make a good memory. Kayla who was born and raised in New England found her passion for animal care when she was very young, and was fortunate to have parents that allowed her the opportunity to rescue/raise a variety of pets. Kayla followed that passion into adulthood volunteering at local shelters, and the college she attended. Now, Kayla is able to cover many roles for our hospital, creating relationships with patients, and clients alike. In her down time, Kayla enjoys spending as much time outdoors in the sunshine as possible with her son Ryker, and she also continues to pursue her hobby of photography, with her pets being some of her favorite subjects to capture! As a young girl Tanya knew she would work with animals. Tanya worked at multiple horse stables, from exercising the horses to cleaning stalls. 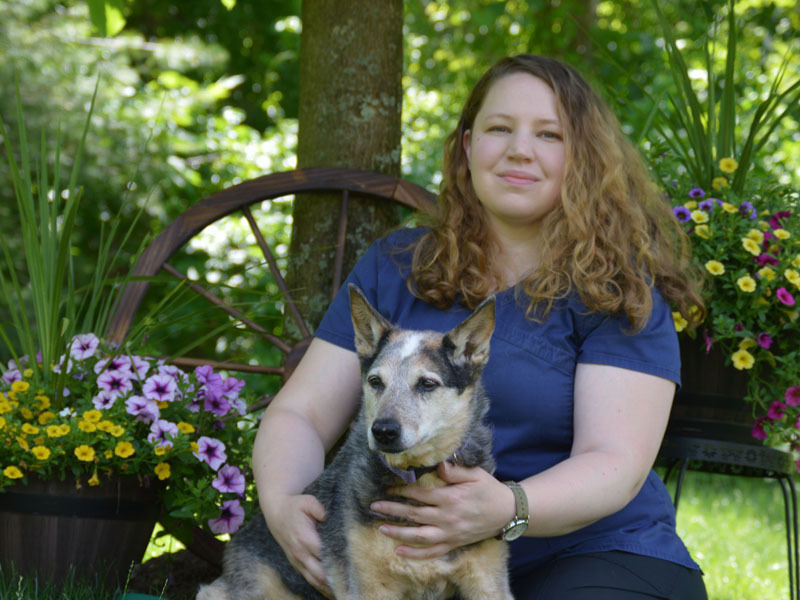 After graduating high school 2004 she and her family moved to Florida and started as a kennel technician while working her way up to Veterinary technician in a year. Her husband, 4 dogs and 2 cats moved back to NH from FL in 2015. In her free time Tanya likes to read and spend time with her husband antiquing, driving around to new places, they also raise chickens and maintain their vegetables and flower gardens. Anne has been a veterinary technician since 2002. She is a Laconia native and graduated from the University of Maine in 2001 with a degree in Wildlife Biology. She currently shares her home with her 2 Australian Cattle Dogs, Sydney and Dodger, her cat Felicity, and her flock of chickens. In her free time Anne enjoys spending time with her husband and son, collecting comic books, hiking and beekeeping. Well hello there, my name is Boots, and not to brag, but I’m kind of a big deal around here. I joined the Manchester Animal Hospital family in October 2012, and have been living it up since. I generally can be found up front, on the counter or keyboards, supervising the receptionists. I also enjoy sprawling out and getting love and attention from all the humans who visit us here. 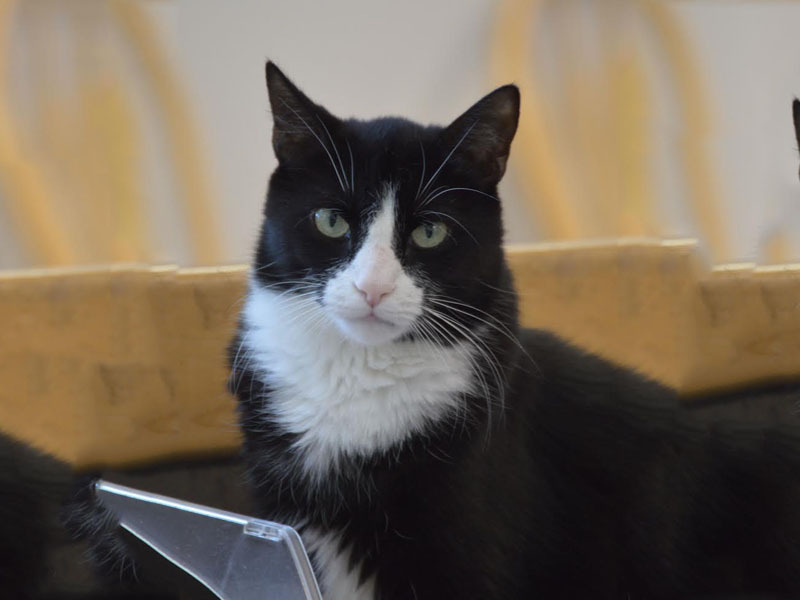 I’d like to say I’m perfect, but I do have a small habit of tearing into the pet food bags we sell here, every time I do it, the humans give me “one more chance”, or its “big trouble”, but as you can see I’m still here, loving life, and going strong. They love me so much here, I can’t imagine life anywhere else, and am so glad they adopted me! Hi! My name is Lefty. I got my name from my friends at Manchester Animal Hospital, they chose it especially for me because I have a very different looking left paw. You see, a very tiny human wrapped a rubber band on my paw- it was really bothering me, so I hid in the attic for a few days. By the time my humans found me, my paw was in very bad shape. After bringing me into Manchester Animal Hospital and making some tough choices, my humans thought it best for me to stay with Dr. Ball, and all of my friends at the hospital. Dr. Ball fixed me right up! Now, all these years later I am still here, and happy as can be. When you visit you may not see me very much, I am a little afraid of some humans, so I hide out in the back of the hospital. 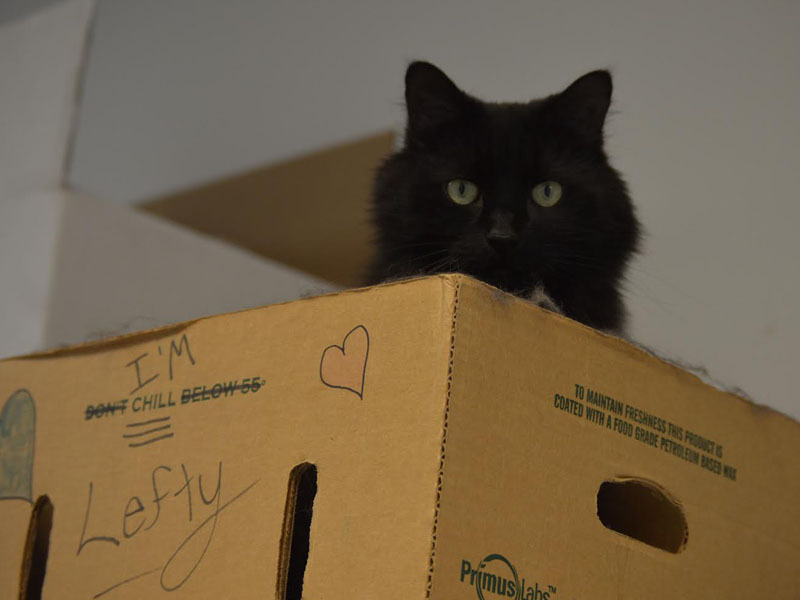 I have a lot of friends back there, and I also have a very cool box that I just love to sit and perch in. I do come into the lobby sometimes, but mostly only to try to steal the breakfast of my friend Boots…he doesn’t like it much, but I am a very hungry boy, and I can’t help it! Everything happens for a reason, and I know I was meant to be here, so I guess I am okay with a funny looking paw, it gives me character!